The novel I am working on at the moment is about the life of Jane Dee, wife of the famous scientist and mathematician John Dee, who is also remembered for his magical conversations with the angels through his scryer Edward Kelley. Much, although not all, of John Dee’s writing has been preserved and whilst reading his diary I noticed that he mentions a solar eclipse on the 25th February 1598. He says that it was cloudy but that a great darkness fell about half past nine – the same time that we will see the solar eclipse tomorrow (20th March 2015). 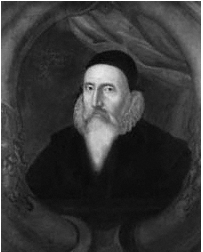 In 1672, Elias Ashmole was planning to write a biography of John Dee and he went to visit an elderly lady named Goodwife Faldo, who was aged around 80 years and who was the last person alive at that time who had personally known Dr Dee. She told him that her memories of the magus were vivid and that he had been a very handsome man, tall and slender with a fair complexion. He dressed in an artists’ gown with hanging sleeves and had a long pointed beard, which turn snowy white in his old age. Amongst other recollections, she described how she and her mother, who later nursed Dr Dee, had been invited into his house where, in a darkened room, he had shown them the solar eclipse projected through a pinhole. Goodwife Faldo was six years old at the time and it must have made quite an impression on her. Maybe she was afraid too – not of the eclipse, which Dr Dee would have explained to his assembled guests – but because the local children would run away screaming if they caught sight of Dee because he ‘was accounted a conjuror’. Another version of the story about the eclipse records that Dr Dee demonstrated the eclipse to the Polish ambassador. Perhaps this is also true. I don’t suppose that he put on the show especially for Goodwife Faldo and her mother, but rather that there would have been a room filled with excited observers as they watched the moon creep across the face of the sun. I think what interests me especially is that Dr Dee gathered these people to watch the eclipse safely. The little six year old’s eyesight was not damaged by looking directly at the sun. So, do the same tomorrow. Watch carefully!